Shihan Henderson Practicing Kata or “moving meditation”. The Martial Arts have a long tradition of being associated with spiritual awakening and spiritual pursuit. The Bubishido Monks follow this tradition while ensuring that the spiritual aspects of martial arts training remains the central focus. A martial artist who walks the spiritual path as a monk is called a “Gyoja“. These individuals hold the mind-set of continuous spiritual improvement while endeavoring to find their own unique spiritual path leading to a place of higher personal growth, understanding and integration with their surroundings. The spiritual quest of a Gyoja is wholly a personal one. Bodhidharma is credited with integrating physical training to spiritual training in the 5th century. 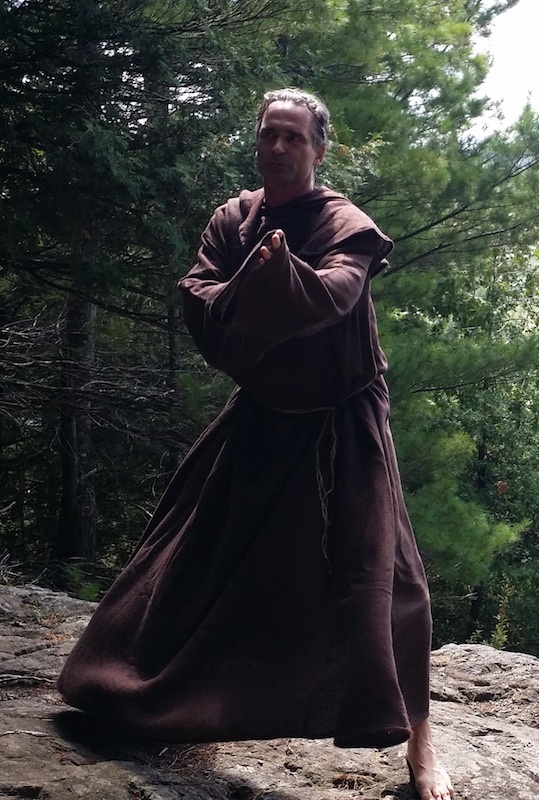 He introduced a form of Zen training that was integrated into the Shaolin Monastery. These early Shaolin practitioners, who would go on to develop “Kung-fu” from where Okinawan and Japanese arts are formed, would resemble more of a monk than a martial artist as we see them today. The mission of the Bubishido Monks is to return to a more spiritually centered martial arts training akin to that of the early Shaolin monks. The path of the Gyoja is open to anyone who has pure intention and a desire for spiritual growth. 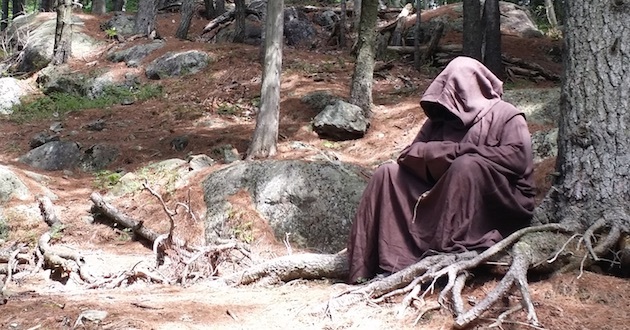 Spiritual training of the Bubishido Monks is always performed out of doors. The attire of the Bubishido Monks is the habit tied with a simple rope or twine. The Bubishido Monk sees him or herself as a Yamabushi or “Mountain priest”. The rite of the Bubishido Monk is the Jogyo-sammai or continuous walking, Joza-sammai or continuous sitting coupled with Kata practice “moving meditation” (neither sitting nor walking) to reach illumination. Bubishido Monks are ordained once they complete their first pilgrimage. They commit themselves to a life of following their spiritual path through the martial arts. Shihan York Practicing Joza-sammai, or continuous sitting meditation.